The writer reflects on the role of language, foreign and Arabic, colloquial and classical, in Morocco; and on the appropriation, polarisation, and xenophobia of the Egyptian counter-revolution. To dispense with the first, I have little doubt that the very high levels of illiteracy (a recent op-ed by Abderrahmane Lahlou in L’Economiste quotes Ministry of Education figures for illiteracy as high as 76 percent at primary grade four) are not going to be significantly reduced until the diglossia on which they rest is resolved. This means some version of the Zakoura Foundation’s proposal to make darija the language of instruction at least in early primary, before converting to fusha when pupils are ready. (Zakoura describes this process as building a passerelle, or footbridge, from the mother tongue to Arabic.) Champions of classical Arabic rest their arguments on Arab or Islamic solidarity, the price of which is widespread illiteracy, and Zakoura’s recommendations have been deliberately misrepresented by many who should know better. There is no visible evidence that Arabic is well enough taught in Moroccan schools for there to be any hope of its prospering as the universal language of literacy. It is a discussion that needs to be conducted on evidence, but the scenes of emotional and histrionic disorder that break out in parliament whenever it arises suggest that the day of evidence-based discussion has not yet arrived. Parliament itself is not wholly qualified to handle the evidence: Houda Filali-Ansary wrote in La Vie Eco of the last parliament, “si l’on trouve toujours des élus ayant le niveau d’études primaire, ils sont de moins en moins nombreux, tout comme l’élu totalement analphabète est une espèce en voie de disparition. Certes, dans un certain nombre de cas, il s’agit de députés d’un certain âge.” In other words, a certain number of older MPs can’t read themselves, and others have only primary education. Well, it’s generally the old fellows waving their order papers and shouting. As for foreign languages, which the King emphasised so strongly in his August 2013 education speech, French is becoming the language of an old elite. Demand for English is growing very fast, and that for French is not. A senior fonctionnaire said to me a couple of years ago “La francophonie, c’est une prison,” the language of a colonial and post-colonial elite which is of less and less currency in the world of ideas and research, let alone film, music and youth culture. Certainly there is much that is to be treasured in francophone Moroccan literature, and it will always be accessible, but English seems to be becoming the foreign language of choice for the younger generation. Willy-nilly. As I said in response to a recent argument on Twitter on this subject, we may not like it – but complaining about it is a bit like complaining about the weather. I tweeted a link to an essay I wrote last year, towards the end of my four years in Morocco, called Bavures and Shibboleths: The Changing Ecology of Culture and Language in Morocco, which I think adds something to the discussion, and you can find it here. This blog was first published on Mercurius Maghrebensis in April, 2015. At the beginning of 1973 I spent a few months in Cairo. War with Israel was in the offing, and preparations for it were under way. At the most mundane level, blast walls were built in front of the entrances to blocks of flats, and windows taped; at the Egyptian Museum Tutankhamun’s mask and regalia were protected by a thick emplacement of sand-bags and only visible with a flashlight, through narrow slits. One day in January or February that year I went to the Cairo Palace cinema off Alfi Bey Street to see Costas Gavras’s splendid film ‘Z’ about régime murder and cover-up under the Greek dictatorship. It was only shown once—the High Court had over-ruled a government ban, and ‘Z’ got just one token outing before the authorities closed the cinema and stopped it being shown again. For that one show, the cinema was surrounded by a cordon of riot police, an irony not lost on the unusually silent audience. Before the screening of the main film, there was a black-and-white public information short, instructing the audience about how to deal with napalm attacks. Two bored soldiers stood in a slit-trench with their helmets lying on the sand-bagged parapet. Suddenly from off-screen dropped a great blob of what looked like egg-white, or snot, landing on one of the soldier’s helmets. At once, all was action. The soldiers jumped to, tipping sand over the (still obstinately not-burning) jelly, and the military equipment was vigorously and demonstratively saved from destruction. And that was that. It was an odd enough little vignette to remain in my memory 42 years later, a gloriously inept attempt to enjoin vigilance without too much panic, a paranoia sanitised to the point of meaninglessness. This ‘infomercial,’ issued just as Morsi took office, comes from the same stable. 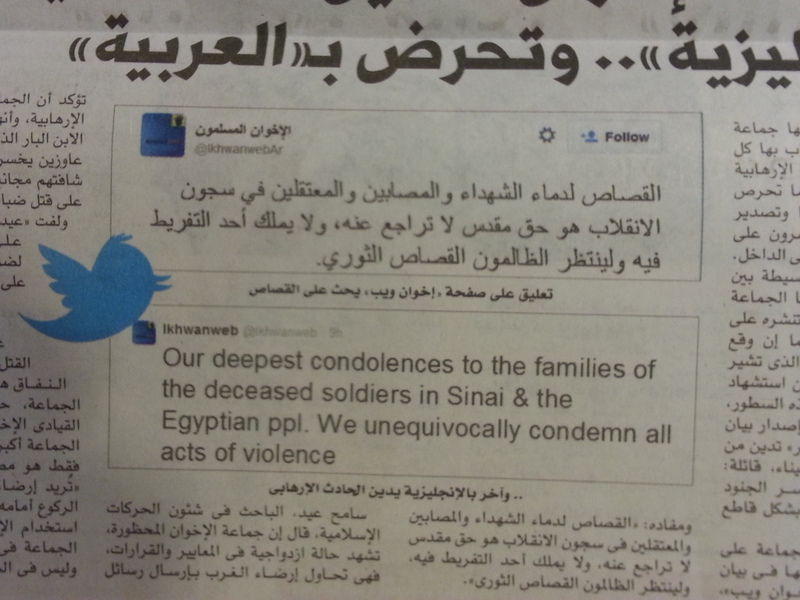 Foreigners, particularly those with blue eyes and agile texting-fingers—are a Bad Thing, determined to undermine Egypt. A short and delightful visit to Cairo last week reminded me that distrust of the west lies only a little beneath the surface, and that a cultivated paranoia is part of the package by which the government, like all Egyptian governments, seeks to consolidate its support. However, as the man in the old joke said, “I’m not paranoid—it’s just that everyone’s out to get me;” and there really is quite a lot to be worried about in Egypt. It was certainly a very difficult week, beginning with Revolution Day celebrations in which a blameless teenage girl was shot on Talaat Harb while carrying flowers to a commemoration in Tahrir Square. Another twenty people, some of them considerably less blameless, were killed at demonstrations during that weekend, and a number of bombs exploded. Later in the week there was a devastating rocket attack by terrorists on army positions in the northern Sinai, in which another 30 or so soldiers—plus a number of Islamist expendables—were killed. It is clear that the Egyptian government and state are under attack, and that there is justified fear and serious concern. The murky nexus of the Muslim Brotherhood and the Daech represented by their myrmidons of Ansar Bayt al-Maqdis, is behind both domestic and external violence. So I was told variously that I shouldn’t necessarily believe the story of mass treason convictions in Minya after a 20-minute trial (despite the newspaper reports); nor that the unfortunate Shaaymah al-Sebbagh was shot by a riot policeman (despite the film of the incident on YouTube). But what I found most striking was the widespread belief that western governments and the western press support the Muslim Brotherhood. I think the Manichean binarism of chaos and order has become a filter for virtually all information and opinion. It isn’t possible, ultimately, for a western journalist or leader to condemn human rights infractions by the Eyptian army or government, without ‘being’ a supporter of their Islamist nemesis. You’re either with us or against us. All sorts of straws are adduced, meetings at State Department, the toleration of Brotherhood supporters in western capitals. But I found it hard to begin to get my head round the belief that our governments support violent Islamist extremism. The opposite is true, whatever one may think of the actual policies that shape western actions. The opposite is true, and how could it be otherwise? All the countries of western Europe are struggling with their own blowback from the Syrian-Iraqi wars and are desperate for Arab support in their reactions there. In Egypt, they find an uncompromising military government which is determined to break the Islamist insurgency, and of course they support that. Sisi did not have to wait long for western approval after he was elected to replace Morsi. In the last year his government has worked hard to burnish his and Egypt’s image. The growing insurgency in Sinai, now linked directly to Islamic State (ISIS) has helped too. Sisi was feted when he attended the World Economic Forum in Davos last month. That the Muslim Brotherhood is a violent organisation bent on overthrowing the Egyptian state (for starters) is quite clear. 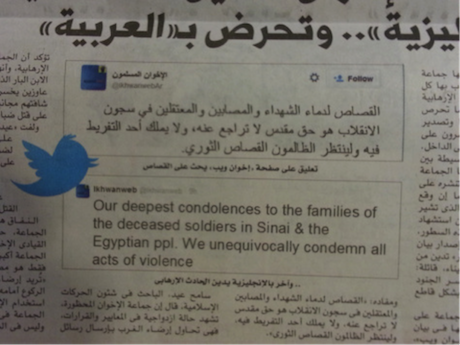 It is also profoundly dishonest and speaks with a decidedly forked tongue, as this screen-grab of two rather contradictory and simultaneous ‘official’ Brotherhood tweets (assuming it to be genuine) demonstrates: in English (@Ikhwanweb) the writer is all condolence for the dead soldiers’ families and soft soap, “We unequivocally condemn all acts of violence.” In Arabic (@IkhwanwebAr) he talks of “settling accounts for the blood of martyrs and prisoners,” and “the revolutionary reckoning awaiting tyrants.” Odd twittery bedfellows. But there does seem to be a marked reluctance to let the truth do the heavy lifting and drive out the lies. Peter Greste of Al-Jazeera was released this week after 400 days in prison for reporting the Brotherhood. Part of a foreign—in this case Qatari—plot. His detention did infinitely more damage to Egypt than his ephemeral reporting, which would have been forgotten in 24 hours. I am not clear whether he has blue eyes. It hasn’t. And it has become a part of the gathering solidarity of Egyptians behind their leader and the struggle against violent disorder. They have seen what that ideologically driven government brings, and they don’t like it. (Nor does any civilised person, anywhere.) One can only sympathise, while hoping that it will gradually become easier to focus a little more exclusively on the bad guys. Kulina geish, indeed. This blog was first published on Mercurius Maghrebensis in February, 2015.